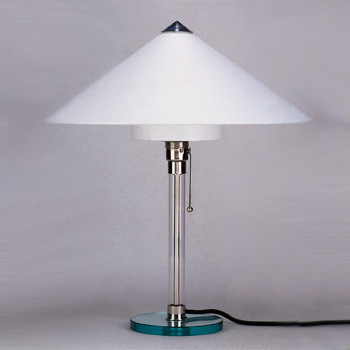 Looking at the WG 27 table lamp an artistic proximity to German Bauhaus design is pretty unmistakeable. And that is not even surprising if you consider the designer's background. Wilhelm Wagenfeld, who later became a professor of fine arts, made his first steps at the Bauhaus workshop, which definitely left a lasting impression. The knowledge he collected there was the basis for the developmental process which lead to his characteristic creations. The WG 27 was created during one of those experimental processes. When Tecnolumen decided in the late 70ties to relaunch some of Wagenfeld's lighting objects, WG 27 directly made it to this range. The nearly identical replica origins from old drawings and differs only in material: while the shade was made of cellophane back then, it is now made of a heat resistant material. Despite its age Tecnolumen WG 27 has a stylish design that is still or again impressing and relevant.